These are important times for Europe: Times that call for new ways of thinking to emerge with the ability to grow together to create a vision that will give new impetus to our old continent. The churches can play an important role in this. Their credibility, though, is under pressure right now, but that can change. Especially when Europeans come to see that the churches are their allies in building a peaceful society that is worth living in; then a new future will be flung wide open for the churches in our secularized world. 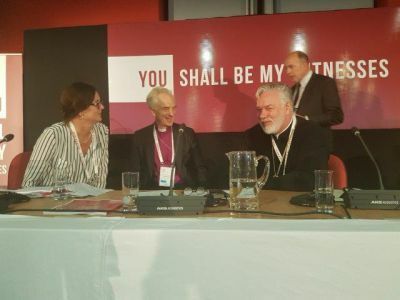 That is the conviction that I personally am taking with me from this General Assembly of the Conference of European Churches. By exploring the themes of 'hospitality, justice and witness', we have been set on the right path for a real practical proclamation of the Gospel. These three themes make it clear that churches can no longer focus primarily on salvaging their own existence in the form of their own organisation, with its associated power and influence, even if these are in decline. To resolutely confront developments in our societies: that is the path that was pointed out here for the churches. The Archbishop of Canterbury, Justin Welby, spoke of the fragile state of Europe. The German Bishop Petra Bosse-Huber highlighted the credibility crisis which engulfs Europe today, and Archbishop Antje Jackelén of Uppsala, in her analysis, referred to four main diseases: populism, polarisation, protectionism and indifference. Europeans are finding it increasingly difficult to believe that it is possible to make their continent a home for all those who are born there and those who seek refuge there. The ‘refugee question’ is a sign of how low the self-esteem of Europeans has sunk and how firmly they are trapped in their fears. It is clear, that some politicians use this to serve their own interests. Where are the leaders (m/f) who, together with us, want to build up the House of Europe on the foundations of a past in which, it is true, we find much misery and war, but also great spiritual riches? In this respect, Novi Sad serves as a symbol. Twenty years ago, the bridges here were bombed. To this day, people do not understand why. The bridges have now been rebuilt. Building bridges is much needed in Europe, and the churches can show the way. This must be a way that explicitly include those of "other faiths" such as Muslims and Jews. "Believers" must walk together! Christianity is always about crossing boundaries to bring the good news of God's love to others; like the Good Samaritan or Jesus himself or Paul and so many others after them. The young Orthodox theologian, Tauri Tölpt from Estonia, cited John Chrysostom, who does not want the church to come with raised finger to say how everything must be done, and then judges those who do it wrongly. On the contrary, the church is called to be a hospital. Our society is not in good health, as Tölpt explained, and therefore it needs care and attention so that it can recover; and this care is to come from the church! This brings us back to ecumenism itself because the churches still have much work to do to break through the confessional boundaries that separate the many denominations. This is perhaps the main reason for the existence of the Conference of European Churches: that Christians from different faith traditions can work and serve together to build up this "House of the European Community". Europe is, of course, not confined to the European Union, although this certainly plays an important role on our continent, but also includes Russia, Serbia, Georgia and all the other countries. During the meeting, special attention was also paid to our closest neighbours in the Middle East, countries with which Europe has always had a special relationship. Our fellow Christians in the Middle East need our support and solidarity, but not our interference! - as Souraya Bechealany, Secretary of the Council of Churches of the Middle East said. Five years ago, the Conference of European Churches seemed to be mired in deep crisis. This was another example of the lack of bridges between various churches, with each church being driven by its own goals. The fact that this sort of attitude weighs heavily on the credibility of the Christian witness now seems to be somewhat better understood. The Conference has been reorganized, is more efficiently structured and has a reliable team of motivated employees. This has been one of the reasons why this General Assembly has been able to focus its attention again on more relevant topics. The 'Charta Oecumenica', that inspiring document from the year 2001, could be given renewed space. And so, the churches grow together in their vocation to be a true sign of hope for Europeans. Europe has a future; and so has its church!